Supramolecular chemistry is ‘chemistry beyond the molecule’ - the chemistry of molecular assemblies and intermolecular bonds. It is one of today’s fastest growing disciplines, crossing a range of subjects from biological chemistry to materials science; and from synthesis to spectroscopy. Supramolecular Chemistry is an up-to-date, integrated textbook that tells the newcomer to the field everything they need to know to get started. Assuming little in the way of prior knowledge, the book covers the concepts behind the subject, its breadth, applications and the latest contemporary thinking in the area. It also includes coverage of the more important experimental and instrumental techniques needed by supramolecular chemists. The book has been thoroughly updated for this second edition. In addition to the strengths of the very popular first edition, this comprehensive new version expands coverage into a broad range of emerging areas. Clear explanations of both fundamental and nascent concepts are supplemented by up-to-date coverage of exciting emerging trends in the literature. Numerous examples and problems are included throughout the book. A system of “key references” allows rapid access to the secondary literature, and of course comprehensive primary literature citations are provided. A selection of the topics covered is listed below. Supramolecular Chemistry is a must for both students new to the field and for experienced researchers wanting to explore the origins and wider context of their work. 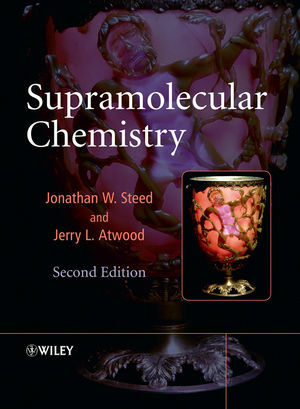 "At just under 1000 pages, the second edition of Steed and Atwood's Supramolecular Chemistry is the most comprehensive overview of the area available in textbook form...highly recommended." Jonathan W. Steed was born in London, UK in 1969. He obtained his B.Sc. and Ph.D. degrees at University College London, working with Derek Tocher on coordination and organometallic chemistry directed towards inorganic drugs and new metal-mediated synthesis methodologies. He graduated in 1993, winning the Ramsay Medal for his Ph.D. work. Between 1993 and 1995 he was a NATO postdoctoral fellow at the University of Alabama and University of Missouri, working with Jerry Atwood. In 1995 he was appointed as a Lecturer at Kings College London and in 1998 he was awarded the Royal Society of Chemistry Meldola Medal. In 2004 he joined Durham University where he is currently Professor of Inorganic Chemistry. As well as Supramolecular Chemistry (2000) Professor Steed is co-author of the textbook Core Concepts in Supramolecular Chemistry and Nanochemistry (2007) and more than 200 research papers. He has published a large number of reviews, book chapters and popular articles as well as two major edited works, the Encyclopaedia of Supramolecular Chemistry (2004) and Organic Nanostructures (2008). He has been an Associate Editor of New Journal of Chemistry since 2001 and is the recipient of the Vice Chancellor’s Award for Excellence in Postgraduate Teaching (2006). His interests are in supramolecular sensing and molecular materials chemistry. Jerry L. Atwood was born in Springfield MO, USA in 1942. He attended Southwest Missouri State University, where he obtained his B.S. degree in 1964. He carried out graduate research with Galen Stuckey at the University of Illinois, where he obtained his Ph.D. in 1968. He was immediately appointed as an Assistant Professor at the University of Alabama, where he rose through Associate Professor (1972) to full Professor in 1978. In 1994 he was appointed Professor and Chair at the University of Missouri – Columbia. Professor Atwood is the author of more than 600 scientific publications. His research interests revolve around a number of themes in supramolecular chemistry including gas storage and separation and the control of confi ned space. He has also worked on the self-assembly of noncovalent capsules, liquid clathrate chemistry, anion binding and fundamental solid state interactions, and is a world-renown crystallographer. He co-founded the journals Supramolecular Chemistry (1992) and Journal of Inclusion Phenomena (1983). He has edited an enormous range of seminal works in supramolecular chemistry including the fi ve-volume series Inclusion Compounds (1984 and 1991) and the 11-volume Comprehensive Supramolecular Chemistry (1996). In 2000 he was awarded the Izatt-Christensen Prize in Supramolecular Chemistry. 1.1 Definition and Development of Supramolecular Chemistry. 1.2 Classification of Supramolecular Host–Guest Compounds. 1.3 Receptors, Coordination and the Lock and Key Analogy. 1.5 Cooperativity and the Chelate Effect. 1.7 Thermodynamic and Kinetic Selectivity, and Discrimination. 1.8 Nature of Supramolecular Interactions. 1.9 Solvation and Hydrophobic Effects. 1.10 Supramolecular Concepts and Design. 2 The Supramolecular Chemistry of Life. 2.1 Biological Inspiration for Supramolecular Chemistry. 2.2 Alkali Metal Cations in Biochemistry. 2.3 Porphyrins and Tetrapyrrole Macrocycles. 2.4 Supramolecular Features of Plant Photosynthesis. 2.5 Uptake and Transport of Oxygen by Haemoglobin. 2.8 Semiochemistry in the Natural World. 3.1 Introduction to Coordination Chemistry. 3.3 The Lariat Ethers and Podands. 3.6 Nomenclature of Cation-Binding Macrocycles. 3.7 Selectivity of Cation Complexation. 3.9 Synthesis: The Template Effect and High Dilution. 3.10 Soft Ligands for Soft Metal Ions. 3.11 Proton Binding: The Simplest Cation. 3.12 Complexation of Organic Cations. 3.15 Carbon Donor and π-acid Ligands. 4.3 Concepts in Anion Host Design. 4.4 From Cation Hosts to Anion Hosts – a Simple Change in pH. 5.1 Simultaneous Anion and Cation Binding. 5.2 Labile Complexes as Anion Hosts. 6 Molecular Guests in Solution. 6.1 Molecular Hosts and Molecular Guests. 6.2 Intrinsic Curvature: Guest Binding by Cavitands. 6.4 Molecular Clefts and Tweezers. 6.6 Constructing a Solution Host from Clathrate-Forming Building Blocks: The Cryptophanes. 6.7 Covalent Cavities: Carcerands and Hemicarcerands. 7.3 Urea and Thiourea Clathrates. 7.5 Hydroquinone, Phenol, Dianin’s Compound and the Hexahost Strategy. 7.8 Inclusion Compounds of the Calixarenes. 7.9 Solid-Gas and Solid-Liquid Reactions in Molecular Crystals. 8.2 Crystal Nucleation and Growth. 8.4 The Cambridge Structural Database. 8.9 Hydrogen Bond Synthons – Common and Exotic. 8.11 Halogen Bonding and Other Interactions. 8.12 Crystal Engineering of Diamondoid Arrays. 9.1 What Are Network Solids? 9.3 Layered Solids and Intercalates. 9.4 In the Beginning: Hoffman Inclusion Compounds and Werner Clathrates. 10.2 Proteins and Foldamers: Single Molecule Self-Assembly. 10.4 Self-Assembly in Synthetic Systems: Kinetic and Thermodynamic Considerations. 10.6 Self-Assembly of Closed Complexes by Hydrogen Bonding. 10.8 Helicates and Helical Assemblies. 11.3 Information and Signals: Semiochemistry and Sensing. 11.5 Molecular Analogues of Mechanical Machines. 12 Biological Mimics and Supramolecular Catalysis. 12.2 Cyclodextrins as Enzyme Mimics. 12.3 Corands as ATPase Mimics. 12.4 Cation-Binding Hosts as Transacylase Mimics. 13 Interfaces and Liquid Assemblies. 13.2 Surfactants and Interfacial Ordering. 14 Supramolecular Polymers, Gels and Fibres. 14.3 Covalent Polymers with Supramolecular Properties. 14.6 Biological Self-Assembled Fibres and Layers. 15.1 When Is Nano Really Nano? 15.2 Nanotechnology: The ‘Top Down’ and ‘Bottom Up’ Approaches. 15.3 Templated and Biomimetic Morphosynthesis. 15.5 Microfabrication, Nanofabrication and Soft Lithography. 15.6 Assembly and Manipulation on the Nanoscale. 15.8 Endohedral Fullerenes, Nanotubes and Graphene. Jonathan W. Steed Visit the author's own website for the book. Supramolecular Chemistry, 2nd Edition Visit for supporting material, such as answers and slides of figures. A comprehensive, modern overview of the field of Supramolecular Chemistry and its evolution into the nanoscale. Thoroughly revised and modernised coverage of traditional topics such as molecular and ion host guest chemistry, crystal engineering, networks, topological entanglement, clathrates, self-assembly, molecular devices and liquid phase assembly. Covering new topics such as dendrimers, supramolecular polymers, microfabrication, nanoparticles, chemical emergence, metal-organic frameworks, ion pairs, gels, ionic liquids, supramolecular catalysis, molecular electronics, polymorphism, gas sorption reactions and anion-pi interactions. Unique “key references system” to highlight crucial reviews and primary literature. Exercises and problems with answers on a web site. Careful explanation of difficult or potentially unfamiliar topics. While fully contemporary with modern research literature the book assume little prior knowledge of supramolecular chemistry. Numerous key experimental techniques described in accessible “boxes” useful for the non-expert while maintaining the flow of scientific ideas for the more experienced. All technical terms are carefully explained and placed into context.